On April 9, the Tanartis Company received an important award from the Russian Society of Pathologists (RSP) for their contribution to development of health care in the Russian Federation. 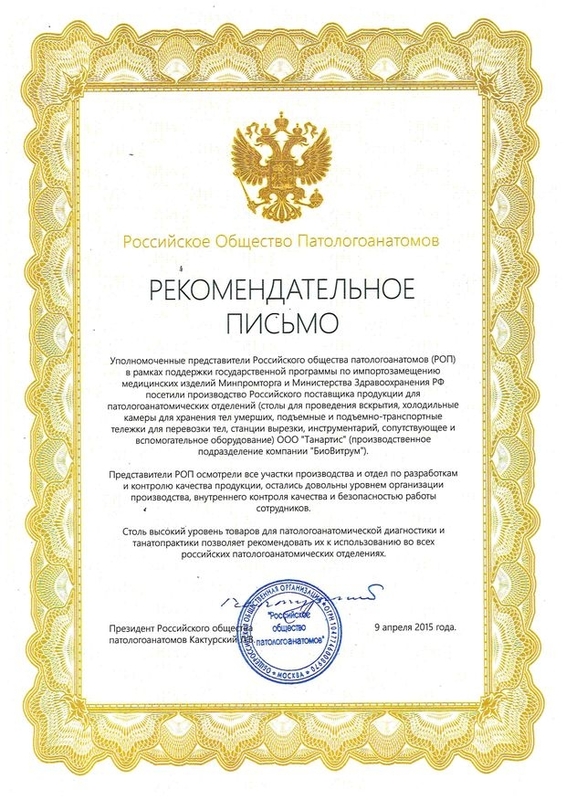 RSP, in the person of the President Lev Vladimirovich Kakturskii, awarded Tanartis Company (manufacturing subdivision of BioVitrum Company) the official letter confirming high level of production of goods for medical purposes for pathology and anatomy diagnostics and thanatopraxy, and recommends it for use in all Russian pathology and anatomy departments and laboratories. And Sergei Vladimirovich Lishchuk, Head of Laboratory of Histology and Cytology of European Medical Centre. “We are very proud of acknowledgement by RSP of Tanartis Company as Russian manufacturer for contribution in development of domestic morbid anatomy. The highest reward for us is the recognition by professional association of specialists who use our innovation products in their diagnostic practice”. Delegation of RSP visited production site of the company in the framework of the ceremony, where the representatives could evaluate for themselves all manufacturing methods and stages of production, high level of internal quality control and workers’ safety. Presentation of full cycle metal production of the Tanartis Company (manufacturing subdivision of BioVitrum Company), specializing in processing and manufacturing of metal parts and structures of any complexity, from preparation of drawings and 3D models making to implementation of sophisticated design concepts. Modern welding machines and turning lathes, welding equipment, 3D tools for plasma-arc cutting of steel are used at the production site; laser processing of metal is performed.